The gates to the Botanic Gardens commemorate King George V.
George V (1865 – 1936) was King of the United Kingdom and the British Dominions, and Emperor of India, from 6 May 1910 until his death in 1936. Holding its first meeting since May, 1939, the King George Memorial Fund Committee last night discussed four suggestions put forward by members for the establishment of a suitable memorial. 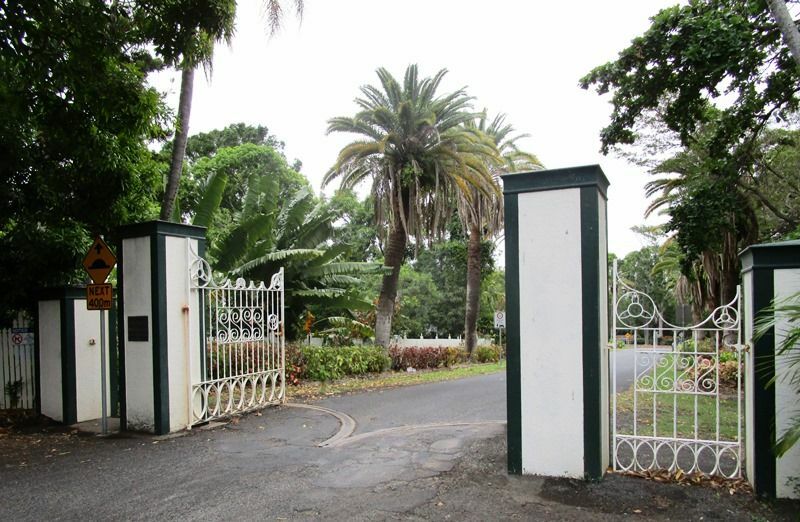 That which was finally selected was to give the £628 in the fund to the City Council to construct memorial gates at the main entrance to the Botanical Gardens. The matter had not received attention for almost eight years, said Mr B. W. Evans, who was voted chairman of the committee, and he considered that it was time to make a start. Morning Bulletin (Rockhampton, Qld. ), 14 February 1947. The simple ceremony which marked the official opening of the King George V Memorial Gates at the Botanic Gardens yesterday afternoon gave to Rockhampton an imposing addition to the city's best known beauty spot. A good crowd, including strong representation of a younger generation that never knew that late king, heard the brief speeches and applauded Mr R. W. Evans as he unlocked the gates and swung them open for public use. Mr Evans was given the honour in recognition of his part in the early days of the move to erect a suitable memorial to King George V, who died in January, 1936. Mr Evans was Mayor of Rockhampton at the time and became chairman of the memorial fund committee. Yesterday he was presented with a gold key as a memento of the occasion. 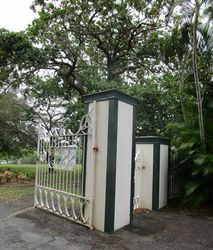 Mr Evans said he knew of nothing more fitting than to erect gates of that nature. In all parts of the world gardens of any importance were given dignified entrances. The people of Rockhampton had risen to the occasion, but he often wondered whether they fully realised the value and importance of their public gardens. During his rambles in other countries he had found people who were acquainted with the Rockhampton Botanic Gardens and spoke highly of them. For the improvement of the gardens in the past decade or so he paid tribute to the Curator (Mr H. G. Simmons). 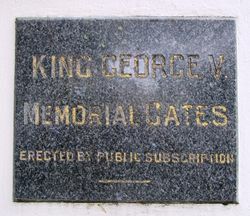 As Mr Evans opened the gates a small Union Jack fell away to reveal a marble plaque set in one column and bearing the inscription, "King George V Memorial Gates. Erected by public subscription." The heavy iron double gates are hung on strong concrete pillars and are flanked on each side by smaller iron gates for the use of pedestrians. A City Council bus was the first vehicle through the gates after the official opening. The function was presided over by the Deputy Mayor (Ald. H. S. Gardner) who outlined the history of the memorial fund. Morning Bulletin (Rockhampton, Qld. ), 1 June 1953.